Today, mobile advertising exchange Nexage released its first quarterly mobile analytics report. Nexage analyzed more than 20 billion mobile advertising impressions per month to assess the health of the market. The picture that emerges is that mobile advertising is making progress and the industry is on a journey to becoming a liquid market, where buyers have certainty to predict campaign performance, and publishers can anticipate revenue more accurately. CPMs grew by 44 percent between Q2 and Q3. The Nexage Exchange experienced a 24 percent per month growth over six months. 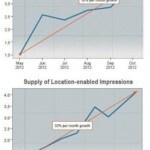 Location ad spend (demand) saw a 30 percent per month growth over six months. Rich media impressions are growing 19 percent and now account for a quarter of all mobile ads served. Location-enabled impressions that include the highest level of detail (lat/long) are 5x more valuable. Video ad impressions are typically 10x more valuable. RTB is growing at more than 37 percent per month (or 220 percent six-month growth) and currently accounts for 26 percent of mobile ad spend.